This might sound sacrilegious, but I didn’t think Darth Vader was that much of a badass (B.A.) after A New Hope. I know, I know. Please hear me out before you swear to never read anything I write again. (If anyone actually reads this). I first saw Episode IV as a little kid in the mid ‘90s. I remember the other characters were scared of him in the movie. He was menacing, towering over everyone in his all black armor and his awesome James Earl Jones voice. But he just didn’t seem to be that big of a deal. Vader took orders from Tarkin, he was obsessed with finding droids, he won a bad (again I was like 7) lightsaber duel with Kenobi and he was a lousy pilot. Sure he could force choke people. But if you stayed away from him you wouldn’t have that issue. It wasn’t until I got older and more into the Star Wars franchise that I began to understand how B.A. he truly was. In Empire Strikes Back he completely wrecks Luke and in Jedi, Vader is only defeated because Luke gives into his anger and taps into the Dark Side. We know from the original trilogy that Anakin was tempted by the Dark Side and turned into Vader, but we were never told the story, that is, until the Prequels came out. This is where it gets interesting. This is my argument for Darth Vader: The Hero of Star Wars. The question I have is; do the ends justify the means? Meaning, if the end game is important enough, does it really matter the method of achieving those goals? Looking at Darth Vader, this is a very interesting concept. Once the prequels came out, in Revenge of the Sith, Anakin Skywalker decided to join Darth Sidious because he wanted to save Padme Amidala, his wife. If someone is making a sacrifice for someone they love, can they really be that evil? Yes, he does end up killing a bunch of younglings at the Jedi temple. Which, by the way, is hands down the worst thing Vader ever does. I’m sure Anakin knows that Darth Sidious will teach him how to evade death, but only after he was fully engaged himself into the Dark Side. The Jedi teach that once you go to the path of the dark-side, it gets a hold of you, and there really isn’t a chance to come back. Anakin has to know this, yet, he still makes the decision to follow Sidious. He ends up failing to save Padme, and the dark side just engulfs him in his hatred and rage. On the Podcast, you hear Devin and Jeremy describe Vader’s redemption. He is the “Chosen One” of the galaxy that brings balance to the force because he was good, then bad, and ended good while defeating the Sith and their rule of two (As far as we know). Without Anakin going bad, (spoiler alert!) he would not have been in a position to throw the Emperor down the shaft and kill him. As Luke continued to say throughout Return of the Jedi, “There is still good in him.” Luke was right. 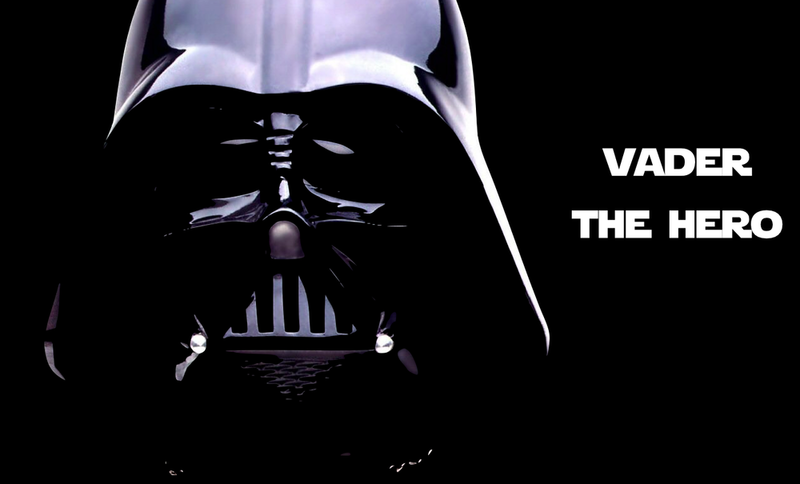 Darth Vader wasn’t completely evil. One of the main themes we talk about here at USW is the hero’s journey. Anakin “Darth Vader” Skywalker went on his own, unique, hero’s journey that ended up with him defeating the villain of the first six installments of the saga. There are others who have done heroic feats, however, I do believe that Darth Vader is really the true hero of the Star Wars Galaxy.